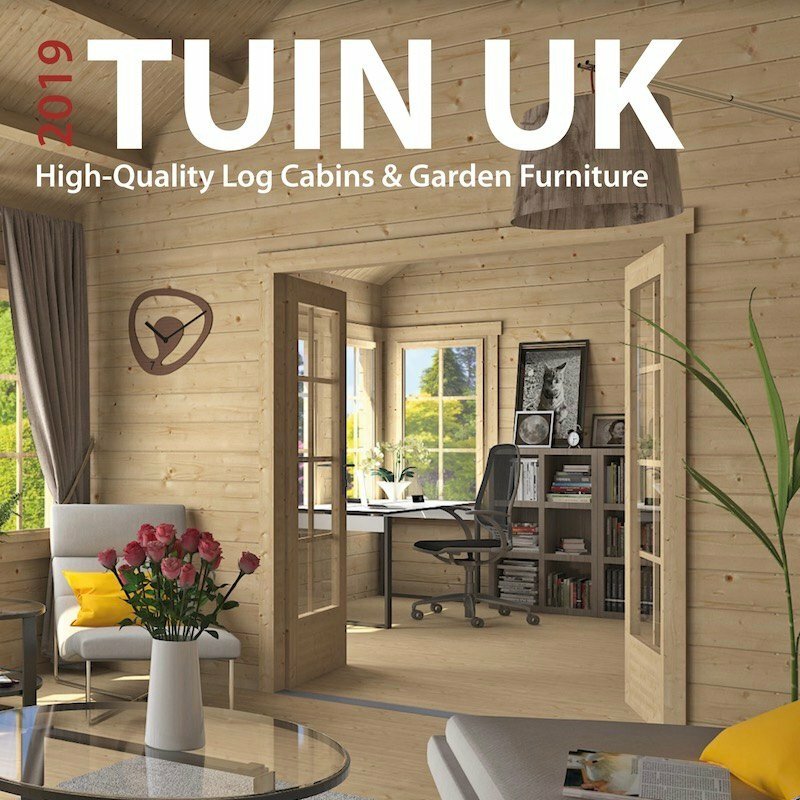 Sometimes we find our selves at a bit of a disadvantage selling log cabins in the UK, the main reason being standards, we have them but don’t really need them here! 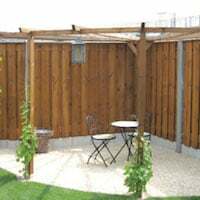 In the UK there are no building regulations for garden buildings, there’s not even guidance. The UK can make anything they want and shed manufacturers do. 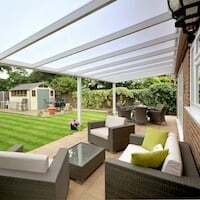 Same with summerhouses greenhouses and of course the same with log cabins – especially when they are ‘Made in England’ or for the UK market and designed for it’s crazy planning regulations. Basically a manufacturer can produce anything they want to, and they do. The trouble we have when competing in the UK is Tuindeco sell across Europe. To do this they have to meet certain standards and not just make ‘anything’ they feel like to a price point. Austria and Switzerland it has to be 90 kg/m.sq. Spain and Greece are substantially lower of course but there are still standards and a lot more so now the Euro-Codes are being adopted more and more. And this is part of the problem we have, you’ll look at the price, the height, but have you thought of the strength you are getting? Will it last over the years without a sag developing? A sagging roof can develop over time due to a miscalculation of loadings or cheap manufacture. Forces acting on a roof of a log cabin are the same as any other structure – Dead Loads and Live Loads. Dead Loads – This is the loading of the weight of the roof itself, the roof boards, purlins / rafters and what the roof is designed for as the final roof covering such as felt or shingles, tiles, sedums etc. Live Loads – This is the weight applied to the roof from external factors such as snow, rain, wind loading and of course maintenance – such as people working on the roof to install it and maintain it. The Output of these loads needs to be transferred to the supporting rafters and purlins, the wall logs and ultimately to the load bearing element which of course is your base and then finally to the earth it is sitting on. We have to make sure the structure is capable of carrying and transferring these forces safely and securely. Of course we also have to make sure that the building will carry on doing this for years and years. The roof needs to be designed correctly for the loads placed upon it. This will be reflected in the ridge height, strength and number of purlins and thickness of the roof boards. This was an interesting picture from 2010 when the whole bloomin’ country was covered in the stuff! It might well have been this that made Scotland adopt the Structural Euro Codes in 2010 and that England is following suit now along with the rest of Europe and several other countries such as Russia, Algeria, China etc. When we design a roof we’re looking at the strength of the timber used, in our case Northern Spruce. We then look at the angles and compare that with the intended roof covering which is always shingles. Lower than 10 degrees WILL result in failure at some point of the shingles, you may not find it for a year or two but they WILL fail, really watch out for low pitch roofs with shingles, you will need to use under-roof membranes and a lot of glue to make sure they seal. They will not be doing any good on their own. Angles play a huge part, for instance for every 10cm we can go higher in the roof pitch we can get an extra 5 kg in supportive weight. This makes a massive difference when calculating the strength of a roof on a log cabin. When we have a ridge height of 2.59cm in the example above there is a reason for it. To reduce the height lower it then would not be strong enough for the snow loading calculations we work to or enough of a pitch for roof shingles to be effective. This map is showing the required snow loading calculations that should be met for a residential property in the UK. You’ll notice the maximum is 80 kg/m.sq and thank goodness Tuindeco cabins far exceed these and I don’t have to worry about a complaint in a few years time! December 2010 was exceptional in the UK’s snowfall, at one point 60cm fell over night and on a lot of roofs 50cm was sat on top. Fresh fluffy snow is about one tenth of the density of liquid water. One litre is 1000th of a cubic meter. One litre weighs 1kg. This means that 10mm of snow is equal to 1mm of water. So, overnight you have 50kg sat on top of each 1m.sq of your roof. As snow settles it will change form several times depending on temperature and time so the weight of the snow on the roof can become heavier due to compacting ice crystals. You can see from this why the UK has a snow loading requirement of 60 kg/m.sq and higher in some parts. 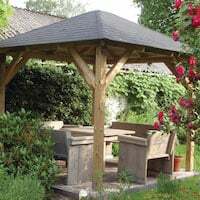 As I’ve mentioned, for garden buildings in the UK there are no standards at all, we can make what we want, out of whatever we want and it’s great for you if it’s to a price point. It may be a bit of a problem down the line though if we carry on having heavy snow falls. Also it’s worth asking your insurance company if a garden building is covered for structural damage caused by snow loading. I bet it isn’t! OSB is 80% cheaper than Tongue and groove Spruce. Cutting a purlin in half is 50% cheaper. If Tuindeco were not constrained by standards in Europe but made solely for the UK everything could be so much cheaper. 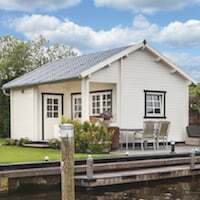 There’s a lot of cheap cabins out there, trouble is they’re not as cheap for the consumer as they should be bearing in mind where the costs are cut. All the good manufacturers list a calculation for the strength of the roof, Bertsch, Lugarde, Scan Holz, Tuindeco. 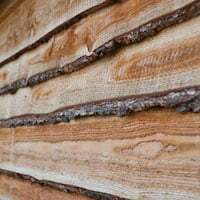 They do this for a reason and it’s an important one that you may not have considered when you are buying a log cabin. I would recommend, regardless who you are buying from that you ask them what specification they build to. The UK standards for building construction asks for a minimum of 60 kg/m.sq and 80 kg/m.sq in some parts of the UK. Your log cabin should at least comply to this. Tuindeco design cabins with a snow loading of 110 to 140 kg/m.sq and this makes for a very strong roof indeed. This calculation is reflected in the ridge heights, strength and number or purlins and the thickness of the roof boards that are used. 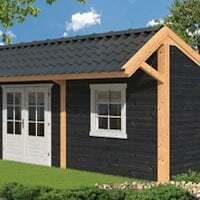 Your log cabin should be designed to at least the UK snow load building requirements. Ask your supplier what the snow loading specification is and ask for a reassurance that your roof will not sag – Ever and regardless of ‘Extreme’ weather conditions! ‘Extreme weather conditions’ is the excuse that will be given when sags start to develop as is ‘Out of Warranty’. This should not be the case in your log cabin or indeed any garden building if it was designed correctly in the first place. Henning log cabin with a substantial roof to withstand snow loading. Extreme snow loading perhaps but it is something to consider! As well as the loading calculations you’ve also got to be able to get on the roof and install the building, you’ll also need to do maintenance on it over time. All log cabin roofs should be designed for this. 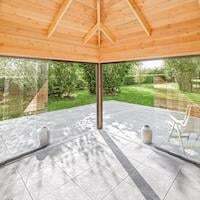 Specifically ask your supplier if this is part of the design intent for your log cabin. There are a lot of cabin roofs out there that you really wouldn’t dare to get on and I’ve known fitters refuse to shingle roofs because of it. 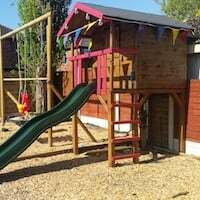 This entry was posted in Technical - Log Cabins and Timber and tagged cabin, installation, loading, log, roof strength, snow, standards by Richard. Bookmark the permalink. Would it be possible to use clay tile a Tuin log cabin roof, or would the weight be too much? It does depend on the building. Our larger ones are designed to take tiles, the smaller ones will not be able to without adding additional roof purlins. 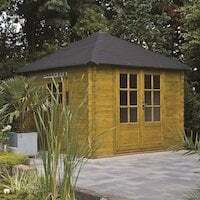 I’m thinking of a summerhouse, but can’t see how the shingles are held in place ( I may have missed it!) . Also as I am in a fairly windy and occasionally snowy area I just wonder if they are going to lift along the edges. Many thanks. Please have a look at this page: Roof Shingles there is a couple of videos on there that show how they are fitted. Using shingle glue is a good idea in exposed areas. 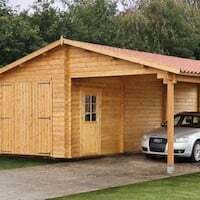 When my Peter cabin arrives I am planning to use two screws to fasten each roof board. Is it necessary to leave a small gap when fitting the tongue and groove boards together, to allow for expansion? I have watched the videos and the fitters appear to fit them tight. It is a good idea to use screws in the boards if you are intending to take the log cabin down again at some point in the future, this will save damaging the boards as it is disassembled. Regarding a cap between the boards an installer needs to consider the time of year. 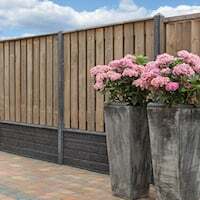 At the height of summer the timber will have a low moisture content and it can be expected to expand in the winter, therefore a gap will be needed. 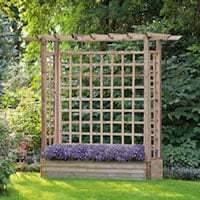 Conversely at the height of winter the timber will be at it’s maximum moisture content and will not need a gap, if you did have a gap come summer it would be too large. Hi we just purchased the Liverpool log cabin. After watching the various videos I noticed that you use nails. Apart from the roof shingles, can I substitute the nails for screws? i.e. on the main t&g boards for the roof. Also can I use a paslode nailer or finishing nailer for other parts? Screws are a good idea but they will take longer to do. If we are putting up a show building or fitting for a customer who expects to move we will always use screws in the roof boards as it will come apart easier. I’ve tried nailers and i really don’t like them, they’re heavy and can fire through too much. I recommend to all installers to nail by hand. Do not ever use staples in the roof as I have seen before. Also I don’t like the in the shingles but I know a lot of installer will use. In all the buildings I installed I would hand nail everything to ensure I would never have to see the customer again, no matter how nice their tea maybe. One last thing, two nails in each board at each junction will stop the boards moving. Some fitters only use one and then have to relay the roof in the winter when it’s curled.